Dutch Partridge Dogs are white with either brown or orange spots. This breed is characterised by a thick coat of medium length. Dutch Partridge Dogs are very sweet and loyal animals. They bond deeply with all family members and are particularly fond of children. Although they are hunting dogs, Dutch Partridge Dogs are very comfortable in the home and make excellent family companions. This breed has been around for hundreds of years and originated in Holland’s northeastern province of Drentse. Likely a descendant of the same stock as spaniels and setters, the Dutch Partridge Dog was developed to hunt all types of game, to pull carts, and to serve as a watchdog and children’s playmate. 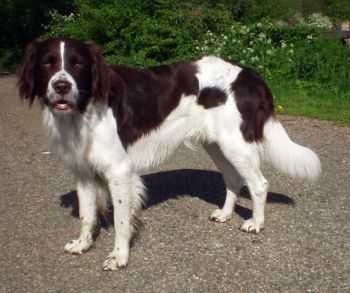 Today, this breed is quite rare, even in Holland. The Dutch Partridge Dog is also known as Drentse Patrijshond, Drent’scher Hühnerhund, and Drentse Partridge Dog. Dutch Partridge Dogs are good-natured and even-tempered animals. These dogs are very persistent and are excellent pointers and retrievers. This breed does not need elaborate coat maintenance since the coat practically sheds away dirt. Brushing the coat after per week giving particular attention using the body components with lengthier tresses will make certain the awesome circumstance in the coat. The dense coat protects the Dog from thorns and brambles. subsequent every day time of hunting, the coat should be thoroughly combed to cut back burrs and cheat grass. Ears although should be often checked and cleaned. Nails and tresses between the pads in the feet will require to be trimmed regularly. Dutch Partridge Dogs are intelligent and driven, and are relatively easy to train. These dogs are quite active and require regular exercise. The Dutch Partridge Dog is a great choice for anyone looking for an excellent hunting dog or an excellent family companion. These dogs fit right in with families and are gentle and loving with children. Dutch Partridge Dogs require plenty of space and exercise as well as daily brushing to maintain their coats. Brush at least after a week.